Students have the opportunity to study English with native English speakers and Thai teachers who are specialized in the English subject. Our curriculum is designed to develop language proficiency through fun activities such as games, songs, chants and role play to encourage the children to communicate and to be confident in using English. 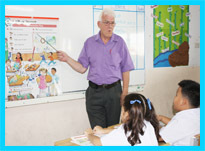 We use various kinds of teaching materials and resources from the US and the UK. We emphasizes on pronunciation and vocabulary development skills. We integrate a phonics approach using Letters and Sounds to enhance the reading and spelling skills. The children not only develop their English language proficiency, but also the cultural side of the English speaking countries through different activities such as songs and festival celebrations for example Christmas parties, etc. Copyright @ 2011 :: www.thunyawit.com :: All Rights Reserved.